1. The Role of Language and "Informal Rigour"
Studies in Logic and the Foundations of Mathematics, Volume 123: Constructivism in Mathematics: An Introduction, Vol. II focuses on various studies in mathematics and logic, including metric spaces, polynomial rings, and Heyting algebras. The publication first takes a look at the topology of metric spaces, algebra, and finite-type arithmetic and theories of operators. Discussions focus on intuitionistic finite-type arithmetic, theories of operators and classes, rings and modules, linear algebra, polynomial rings, fields and local rings, complete separable metric spaces, and located sets. The text then examines proof theory of intuitionistic logic, theory of types and constructive set theory, and choice sequences. The book elaborates on semantical completeness, sheaves, sites, and higher-order logic, and applications of sheaf models. Topics include a derived rule of local continuity, axiom of countable choice, forcing over sites, sheaf models for higher-order logic, and complete Heyting algebras. 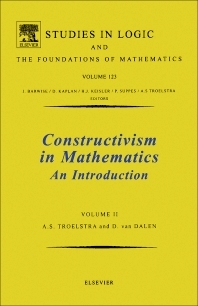 The publication is a valuable reference for mathematicians and researchers interested in mathematics and logic.